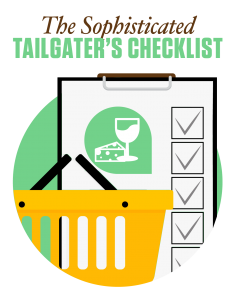 If the verb “tailgate” connotes images of beer and barbecue, then it’s time to pop the clutch on your culinary cruise. There are more ways to enjoy friends and food at your next outing. So as you gather the gang, road trip to College Hill for the Rivalry, and drop the tailgate, think about how you might add some sophistication. Think steeplechase. Think polo match. Think about how you and your cronies deserve better as you reminisce and ready yourself for a Lafayette win. If you have a table, it needs a tablecloth. Silver candelabra with wine decanter and silver ice bucket are optional. Add a nice touch with flowers—hydrangea are the best as they don’t really need water for a few hours. Most tailgates are stand-up parties, but it’s always good to have a few folding chairs for the old folks or big drinkers. Next, the drinks! Start every tailgate with a glass of bubbly to get things going. 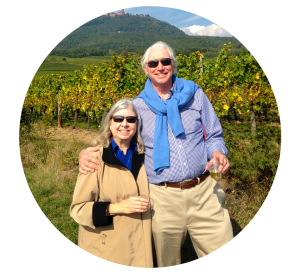 We like the Blanc de Blancs from Greenhill Vineyards in Middleburg, Va., as a special surprise—excellent bubbly from a state coming up in the wine world. I like a Rombauer chardonnay for white. If you want to splurge, a Sancerre is good for the slightly drier crowd (a little more acid—less fruit). Or you could go for broke with a Corton- Charlemagne. If not, then step down to a very good Kendall Jackson Grand Reserve. Replace the Sancerre with a Muscadet for a slightly less pricey wine. For the reds—nothing too heavy for the afternoon—I prefer Côtes du Rhône (the poor-man’s Châteauneuf-du-Pape; it’s from the same “terrior”). Any good Willamette Valley pinot noir would also do well. A young Crianza Rioja would be a good complement to the pinots. To transform your tailgate into a fabulous afternoon tasting event, add a rosé from Provence. Have Perrier, lemonade, and beer on hand for non-winos. Once the important stuff, i.e., table and wine, is taken care of, we can move to the food. Cheese is always good, but don’t use blocks of cheese; instead, cut into finger-size servings. If not, you will have a block of cheese to take home. I like Gruyère. Maybe add a sharp cheddar if you want. Like the cheese, all food needs to be finger food. Large shrimp on a bed of ice is a favorite. Asparagus stalks with a dip of sour cream, mustard, and lemon go over well for veggie lovers. A tailgate staple is a plate of deviled eggs, which can usually be picked up at the take-out catering section of most supermarkets. We also like a simple artichoke dip baked at home and served with crackers. For the hungry, we use mini croissants with chicken salad and ham salad fillers. A curried chicken salad is awesome. At the top of our list are thinly sliced tenderloin sliders. Serve with a horseradish sauce for most, a Dijon mustard for the Brits, and, ugh, mayonnaise for the French (they even eat french fries with mayo). Finally, chicken tenders with a mustard sauce are great. Put them in a fancy bowl if that seems too plain. Dessert can be good old chocolate chip cookies. If not homemade, get them from a bakery just to be sure there’s lots of butter in the mix. If you want to make it easy, use Milano cookies. We also sometimes use mini scones as nibbles. How about a friendly wager? If at a steeplechase, a friendly betting round for each race goes over well. There is not much to do at a polo match unless it’s the new arena polo with three on three in a rink. If a traditional polo match, the party is the game. Gathering on the Quad before football is a good time to have a score matrix—total points scored by quarter. Not into those sorts of games? Then try a challenge, like blindfolded wine tasting. Before the wines are served, see if you can guess the country or area the wines are from and rate them. Then you can raise your glass and soak in a big win or, in the event of a loss, at least enjoy the pre-game party. William Dunlap ’66 is a retired tax partner from Arthur Andersen and Co. and was managing director of firm taxes for Andersen Consulting and Arthur Andersen. He is on the culinary advisory board of Lorenzo-Walker Technical College, treasurer of the culinary and hospitality foundation of Southwest Florida, which provides scholarships to students in culinary and hospitality programs, and treasurer of the Naples branch of International Wine and Food Society.